Starting your day with a hearty breakfast is important to get you moving in the morning, and many people enjoy "eggs over easy." This term refers to a fried egg dish, in which the whites are cooked all the way through, but the yolk remains runny. You may also hear eggs over easy called eggs over light. Eggs impart a range of nutritional value, as well as a savory taste. Two eggs cooked over easy contain 140 to 160 calories. The ideal breakfast size has 350 to 500 calories, according to Columbia University’s Go Ask Alice! website. To bring this dish into the correct range, consider serving two eggs over easy with a lean breakfast meat, such as turkey sausage and a portion of fresh fruit or fruit juice. You may also opt to add a slice of toast to introduce a healthy grain into your meal. One serving of two eggs over easy has 8 to 10 grams of fat, accounting for 51 to 56 percent of its calories. While it is true that too much fat in the diet – more than 20 to 35 percent of your daily calories, or 44 to 78 calories – may result in weight gain, all fat is not created equal. Most of the fat in this dish falls into the category of good fats; only 3 grams of the fat is saturated fat, or the “bad” fat, and you may lower the amount of saturated fat by frying over easy eggs in a nonstick pan, eliminating all or part of butter commonly used in cooking this dish. 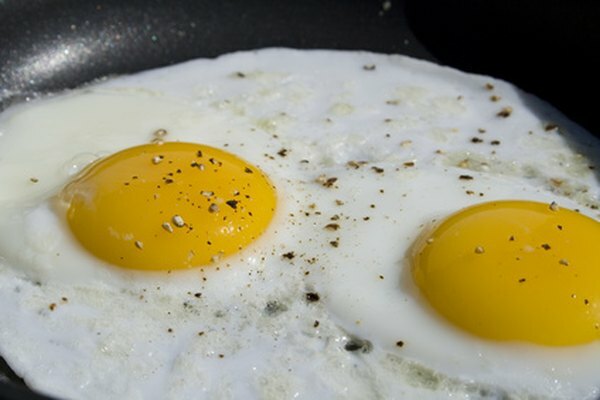 Eggs get a bad rap, so some people may avoid consuming eggs over easy. The Harvard School of Public Health, however, reports that no scientific evidence confirms that eggs directly cause heart disease, and adds that consuming one egg every day is unlikely to result in health problems. In addition, eggs over easy are a rich source of protein – 12 to 14 grams – and contain nutrients that promote vision and memory. However, eggs are high in cholesterol, so eating them every day could cause problems. If you have high cholesterol or run the risk of developing it, consult with your doctor to determine how often you should eat them. Because the yolks in eggs over easy remain raw, the risk of contracting salmonella, a food-borne bacteria, is greater. Salmonella poisoning symptoms include fever, diarrhea and stomach cramps within 72 hours of eating infected eggs. An August 2010 article in "The Pratt Times" notes that most people recover from salmonella poisoning in four to seven days, and many will not require medical attention. However, salmonella poisoning can result in death and other serious problems.